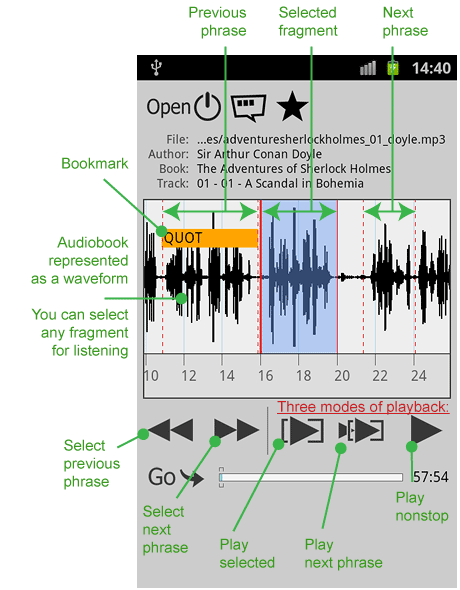 Application shows an audiobook as an audio waveform and lets you select any fragment of it for listening. But actually this isn't necessary, because the application itself searches for phrases very well. You can also correct current selected area: press on selection edge and drag it. As you can see in the above screenshot, the application also shows boundaries of the phrases before and after the current one. "Play selected" and "Play next phrase"
This command is useful for the users with good skills in the foreign language, who rarely need to listen phrases repeatedly and who don't want to repeat phrases aloud (although we would suggest you do repeat them). 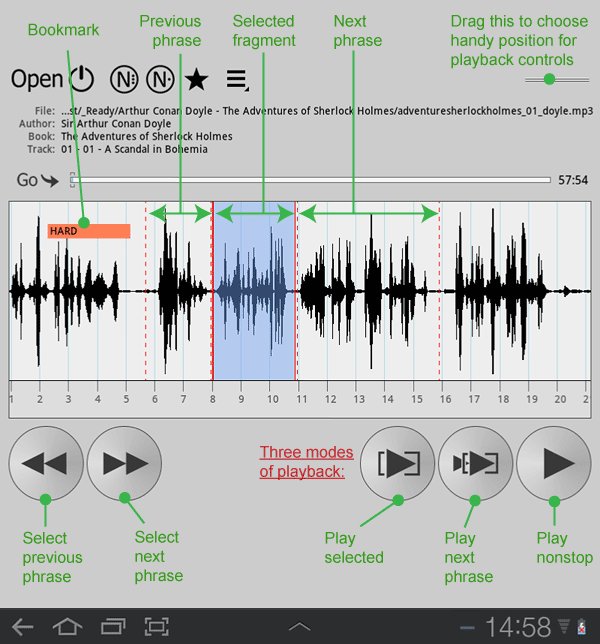 Even in this case, application makes listening of audiobook in foreign language more convenient. Whenever you hear some unclear fragment – just stop the playback and press "Play selected" to replay the last phrase. 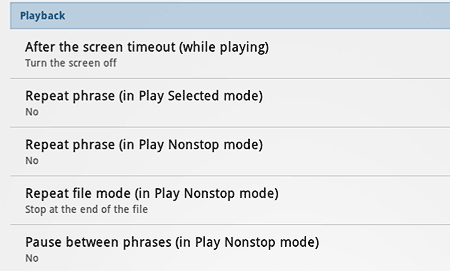 Also, you can set up Auto-pauses. Zoom: Subitems "Zoom In" and "Zoom Out" let you change the scale of the audio waveform. Settings: Application settings, see below. Purchase: If you want to use the application beyond the 14 day of trial period, you need to buy it. This purchase is linked to your Google Play account, so you need to buy Full version only once and you'll be able to use it on all your Android devices. Help: Application help and About screen. It's good that WorkAudioBook splits audio into phrases. But what to do if even after the fifth time it is not clear what was pronounced? You need to look in the text! WorkAudioBook has Notes and Subtitles for this. In the notes for file, I recommend you to place text corresponding to MP3. In the notes for folder it is convenient to place the book's characters, interesting idioms, quotations and so on. Find in the Dictionary: Translates a selected word using your dictionary application. To select a word, press it for a couple of seconds. Use Basic Settings to choose your dictionary application. Edit: Allows you to copy a text into notes and edit it. To create notes files with text corresponding to MP3, I recommend you to use WorkAudioBook for Windows, and then copy all MP3's and notes files as one folder to your phone. I spend approximately 10 minutes to copy the whole text of a book in the "notes for files" for a folder with 100 MP3 files. But then, within tens hours of listening, I can peek into the text instantly, without having to switch to another application. Try it! Increase the "Font size", to make it easier to select the word you want to translate with the help of your dictionary. 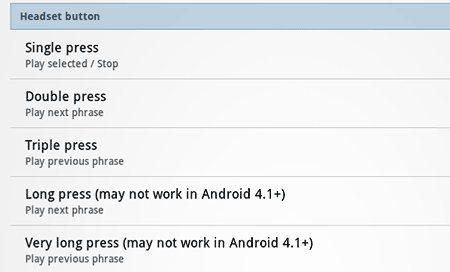 The first three options allow you to control how the program breaks the audio file into phrases. If an audiobook is difficult, it is convenient, when phrases are short. 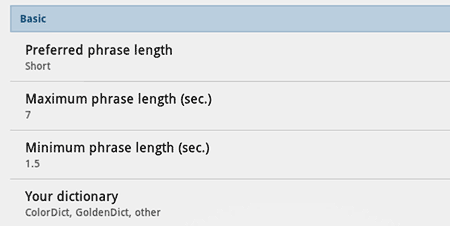 To do this choose "Preferred phrase length" = "The shortest" and decrease minimum and maximum length of phrases. If an audiobook is simple, do the opposite. "Your dictionary" setting specifies the application which is called when you press "Find in the Dictionary" button (in Notes or Subtitles). Choose a program that you have, if it is not in the list, then try the option "ColorDict, GoldenDict, other". If this does not help and none of the dictionaries from the list fits you - write me the name of your dictionary, and if it is popular and the author has provided the ability to call it from another application, I'll add it in the next version of WorkAudioBook. "After the screen timeout" setting allows you to keep your screen turned on, while you are working with the application, or vice versa, turns it off to save the battery. Other settings control the auto-repeat of phrases and files and set auto-pauses.